Regional firefighters Tuesday climbed the Sky Steps in Durango three times, equivalent to the height of the Twin Towers, to honor New York City firefighters who lost their lives in the terrorist attacks Sept. 11, 2001. 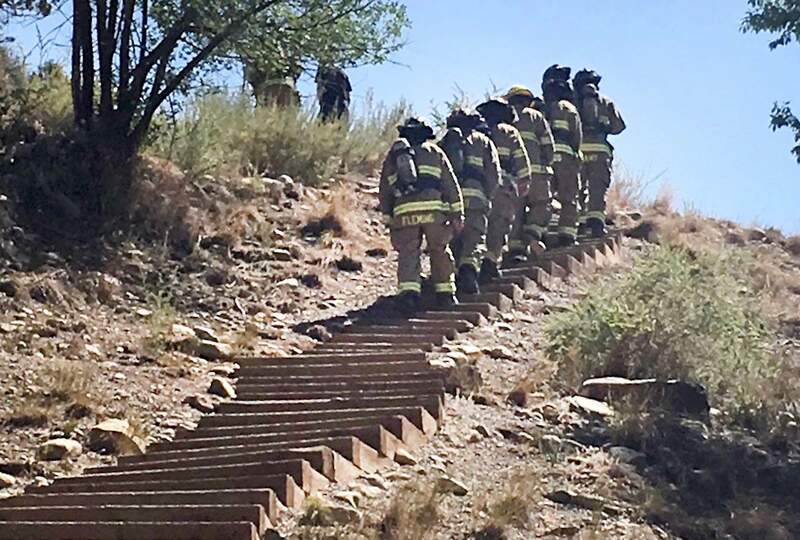 Firefighters from Durango, Bayfield and Farmington fire departments Tuesday climbed the 500 steps leading from Durango to Fort Lewis College three times, equivalent to the height of the Twin Towers that collapsed in the terrorist attacks Sept. 11, 2001. In full gear, firefighters climbed the Sky Steps as part of the 2018 Colorado 9/11 Memorial Stair Climb, a program from the National Fallen Firefighters Foundation. The program honors and remembers the firefighters from New York City who gave their lives trying to save people Sept. 11, 2001. Upper Pine Fire Chief Bruce Evans said local firefighters wanted to be part of the national effort by fire departments to honor the Fire Department of New York. Evans said firefighters climbed the steps in full gear to help make a more empathetic tribute to what the firefighters in New York endured that day. Across the nation, firefighters paid tribute to the heroism of FDNY by climbing a height equal to the 110 stories of the World Trade Center towers. A financial donation made by Unistaff Inc. and Wayne Walters, an Upper Pine River Fire District board member, was also made on behalf of the firefighters to the National Fallen Firefighters Foundation.